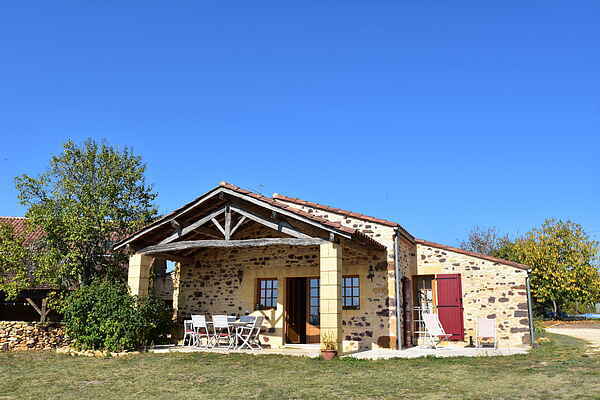 In the middle of the Périgord you'll find this beautiful holiday home in Montferrand-du-Périgord. You'll be able to fully unwind in this ground-floor home with a great covered terrace. Inside, you'll also feel right at home. The living room features a comfortable seating area with wood stove and the open kitchen has a modern cooker, so that you can cook a wonderful meal with local products. The owner also lives on the property, but there is no visual contact. In beautiful Cadouin (6 km) you can get your groceries, but also enjoy the beautiful old monastery. Besides Cadouin, there are also other beautiful villages in the area, like Monpazier (12 km) and Belvès (16 km), built on a cliff. Here you can walk along the church of Moncuq and the bell towers and enjoy the view of the Nauze valley. Trémolat is a great spot for water sports enthusiasts. Surfing, water skiing and sailing, it's all possible. Would you rather take a look underground? At Le Bugue (22 km) and Les Eyzies-de-Tayac-Sireuil (32 km) you can find several caves. An exciting adventure for young and old. At Le Bugue you'll also find a beautiful aquarium and water park.